In the morning, Connie was little better, so the garlic hadn’t quite “stopped the bug in its tracks.” We loaded up, and looked back regretfully at a place we already loved. About an hour later, we stopped at Kalaloch Lodge on the ocean for breakfast. Its predecessor was constructed in the late 1920s; additional cabins were added in the mid 1930s after Hwy 101 had been completed. Between 1950 and 1954, Charles Becker erected the main lodge where we had breakfast. 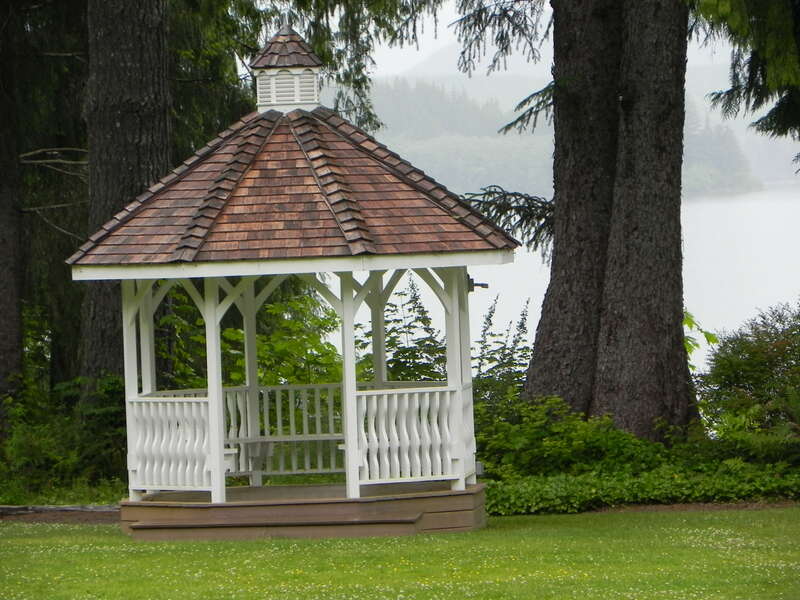 It too is operated by the ARAMARK concession that currently manages Lake Quinault Lodge. Altogether, the lodge services 64 guest rooms, most oceanside cabins. Hard to say which we appreciated most: the delicious breakfast or the sights and sounds of the Pacific. It was early afternoon by the time when, directly ahead of us—smooth as glass—was one of the most beautiful lakes I’d ever seen—Crescent Lake. It almost took our breath away; all the more impressive because we hadn’t expected it; to us it was just another lodge on a lake we needed to check off. We arrived at the lodge just before the wind came up to wreck the mirror imagery. We made our dinner reservations, then since the rooms weren’t ready yet, we drove to Port Angeles then up into the Olympics in order to take pictures of the iconic Hurricane Ridge. Unfortunately, it was socked in by clouds; after having enjoyed beautiful weather at Crater Lake, Oregon Caves Chateau, Timberline, and Paradise Inn, the law of averages now caught up with us—and stayed . So we gave up and returned to Crescent Lake, and found our rooms in a newer addition overlooking the lake. By now the wind had come up, and the temperature dropped. 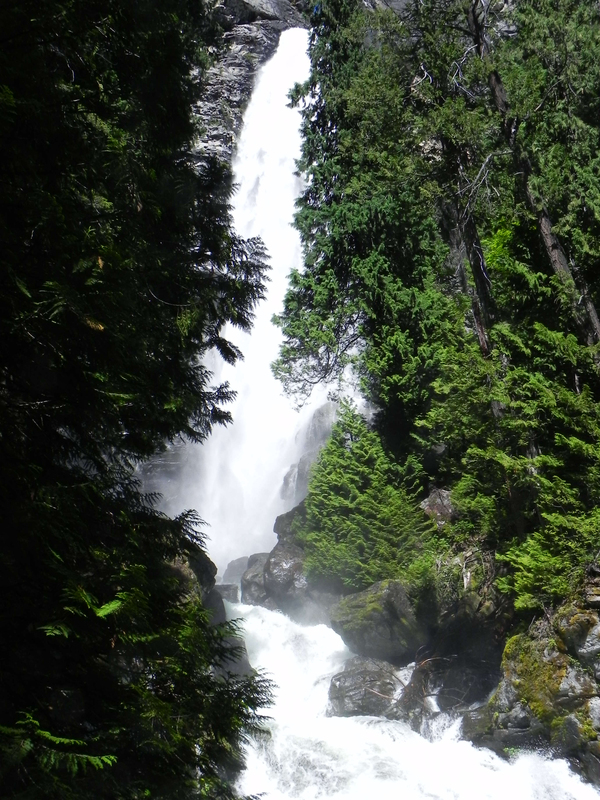 Nevertheless, Bob and I took the trail through the old growth forest up to the 90-foot-high Marymere Falls. Connie had grown up in old growth redwoods in Northern California, so the sight of these didn’t impress her as much as it did the rest of us: but we had now seen the Jedediah Smith grove of Redwoods near Crescent City, CA; the old growth Douglas fir and red cedar in Oregon Caves National Monument and Mount Rainier National Park; then the more diversified old growth at Quinault; now we were back into Douglas fir and red cedar. As we walked through the forest, Bob and I were staggered by their girth and height. Up till this trip, I had always assumed that a redwood tree was the world’s tallest living thing, but on this trip we learned of a Douglas fir that had fallen—it was taller even than the current tallest redwood! These magnificent stands of Douglas fir and red cedar included many thousand-year-old trees! Those who have never seen such trees ought to determine to add them to their bucket list and see them before they die. Two fur trappers (John Everett and John Sutherland) first explored the Crescent Lake area in the early 1860s; so captivated were they by its pristine beauty that they settled in the Olympic Peninsula. Early transportation across the nine-mile-long, mile-wide, and 600-feet deep lake was by canoe; not until 1891 did the first steam launch go into service. 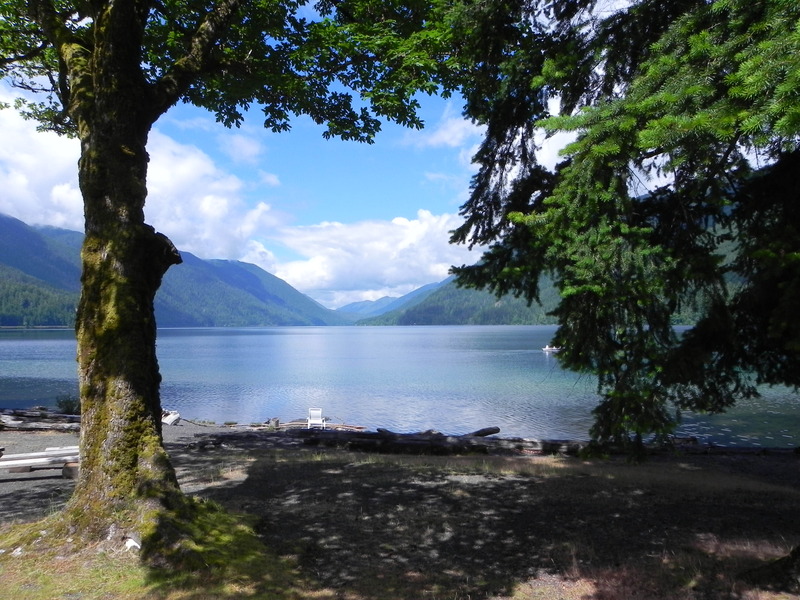 Lake Crescent came under the jurisdiction of the U.S. Forest Service in 1897 when it was included in the Olympic Forest Reserve. As word got out of its beauty, more and more tourists came to see it for themselves. At the turn of the twentieth century, following the lead of Teddy Roosevelt, Americans everywhere were embracing the outdoor life. Train travel had tremendously increased the distance they could travel in a short time; now the automobile made it possible to do the same for areas not reached by rail. Indeed it was the automobile industry that reined in train travel, resulting in the long decline that has continued until our time. On the eve of World War I, 1914, Avery and Julia Singer, recognizing the need for a first class resort on the south side of Lake Crescent, purchased eight acres of lakefront property, constructed a two-story hotel and cluster of cottages—in the then popular Arts and Crafts style. So what greeted guests here? According to Barnes, “Guests arrived by private launch or ferry, enjoyed strolling gardens filled with roses, lilacs, and rhododendrons, and lounged on the tavern’s wraparound porch, taking in the views of the lake and mountains that jutted from the water’s edge. Wisteria draped the hotel’s eaves; croquet, golf, horseshoes, swimming, boating activities, fishing, and exploring filled the days. In the evening, tuxedoed waiters served dinner to guests in evening wear. ‘Civilized’ described the enclave carved out of Barnes Point, a land promenade off the shores of one of the most scenic lakes in Washington. ‘Pastoral’ might also fit the bill.” (Barnes, 69). Inside, the wood-paneled 56 x 33 foot living room was dominated by an impressive two-tiered rock fireplace, crowned with the antlered head of a magnificent Roosevelt elk. It was a perfect place to relax after an activity-filled day. Barnes notes that the entire complex “took advantage of its incredible setting, cupping the shoreline with the bathing beach and small craft and ferry landing docks. The placement of the lodge and cabins to the east created a courtyard effect, making space for a horseshoe pit and strolling gardens a marked contrast to towering mountains, dense forests, creeks, and waterfalls.” (Barnes, 71). The Singers, after expanding their resort to close to a hundred acres with thirty to forty cabins, sold it in 1927. Over the years, many famous guests have stayed here—including Henry Ford, Frank Sinatra, outdoor-loving Supreme Court Justice William O. Douglas, Robert Kennedy, and First Lady Laura Bush. But perhaps most famous of all was president Franklin D. Roosevelt, who, with his entourage, spent the night of September 20, 1937, here; the #1 topic of discussion: Should an Olympic National Park be established? We had no idea when booking this trip that we were thereby intersecting with so much history: Teddy Roosevelt, through the Antiquities Act, saving this area for posterity; Woodrow Wilson, tossing half of it back to the logging industry; and Teddy’s cousin, FDR taking the trouble to travel here himself, dedicating Timberline Lodge on September 28, 1937; spending the night of September 30 here at Crescent Lake Lodge; and then moving on to Quinault Lake Lodge on October 1 (all three lodges that we just visited, FDR did too, in only four days). The lodge remained privately owned until 1951, when the National Park Service purchased the entire property. For a time, FOREVER Resorts managed it; today it is administered by ARAMARK. In the late afternoon, we were ushered to a table with a great lake view for dinner. It was difficult to take our eyes off the scene out the window. Afterwards, we relaxed in wicker chairs and settees in that enchanting flower-bedecked sun porch, still here after almost 85 years. Next morning, Lucy and Connie agreed that one of the worst mistakes of the entire trip was not booking at least a two-day stay here. All agreed that we must come back. It is a place that, once experienced, is guaranteed to haunt your dreams. Barnes, Christine, Great Lodges of the National Parks 2 (Portland, OR: Graphic Arts Books, 2009). [The best source of information for this lodge]. “Discovery and History of Lake Crescent,” [handout]. Rarely has it been as difficult to leave a motel as it was the Enzian Inn—in fact, labeling it as just another “motel” seems almost an insult. Until this trip, I’d never really had a feel for what made Washington Washington: how its circulating system works. Now I discovered that I-90 slices it in the middle; Hwy 14 meanders along the Columbia; Hwy 101 almost circles the Olympics; but the true heart of its mountain treasure chest can be found only in the Cascade Loop: Take Hwy 2 east from I-5 at Everett until merging wit Hwy 97, go north until you merge with Hwy 20; travel west on it until you’re back to I-5 at Burlington. Today we traveled west on 2, through the Tumwater Canyon, over 4,060 foot Stevens Pass (a popular ski area), by jagged and forbidding 6,000 foot Mount Index with its lacy waterfalls, followed the Skykomish River, until we reached Hwy 522, angled down to I-405, veering over to I-5, and south until we could escape on Hwy 12, continuing west until we picked up Hwy 101 north, arriving at our nephew Byron Palmer’s third and last must-see on our trip—Lake Quinault. But I must not leave out the fact that Quinault had been on Bob’s personal bucket list ever since he read about it in Barnes’ book on park lodges. 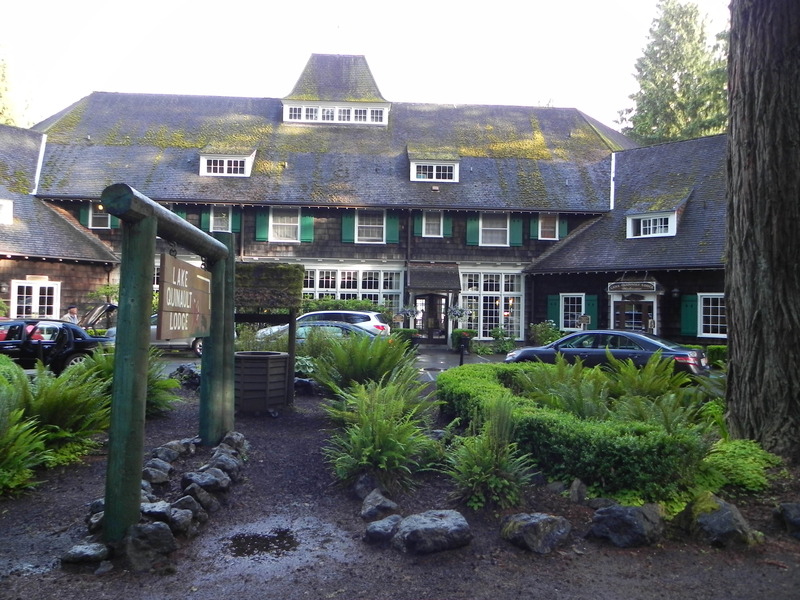 As we parked outside Lake Quinault Lodge, we all breathed a giant sigh of relief: two whole days without having to re-pack our suitcases and move on! It was heavenly. We were lucky enough to snag rooms 107 and 105 in the main lodge (remember those numbers for they’ll come into play before we leave. 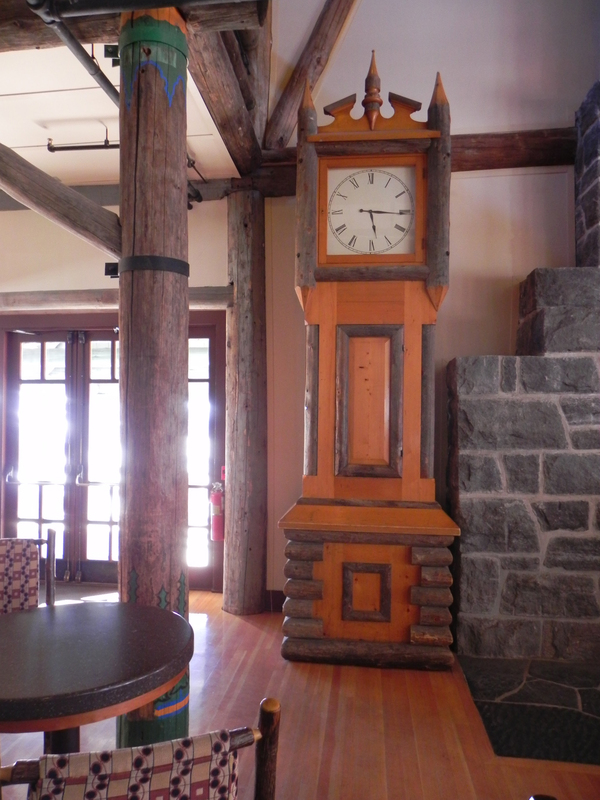 As we walked into the lodge’s great hall, one word came to me: Serenity. It was the most serene place we’d stayed at so far. We felt the pressures ebbing away—even more so when we heard a screech from Bob that could have been heard back in Tennessee: “I’ve found it! I’ve found it!” It’s a wonder hotel management didn’t evict us immediately. Yes, he’d found that wretched little driver’s license: it had been sneakily hiding in a fold of his suitcase all this time. For the first time in days, we could all relax. Especially poor Lucy, who’d had to bear the brunt of his misery. It was a deceptively beautiful day. Outside, guests were basking in the sun in Adirondack lounge chairs on the extensive lawn sloping down to the lake. “Deceptive,” because Lake Quinault is part of the Olympic Rain Forest. Strangely enough, the 925,000 acre Olympic National Park was one of the last places in the lower 48 to be explored (not until the late nineteenth century). 95% of the park, even today, is designated as wilderness; no roads cross its heartland. 7,980 foot Mount Olympus, overlaid with glaciers, dominates the park. 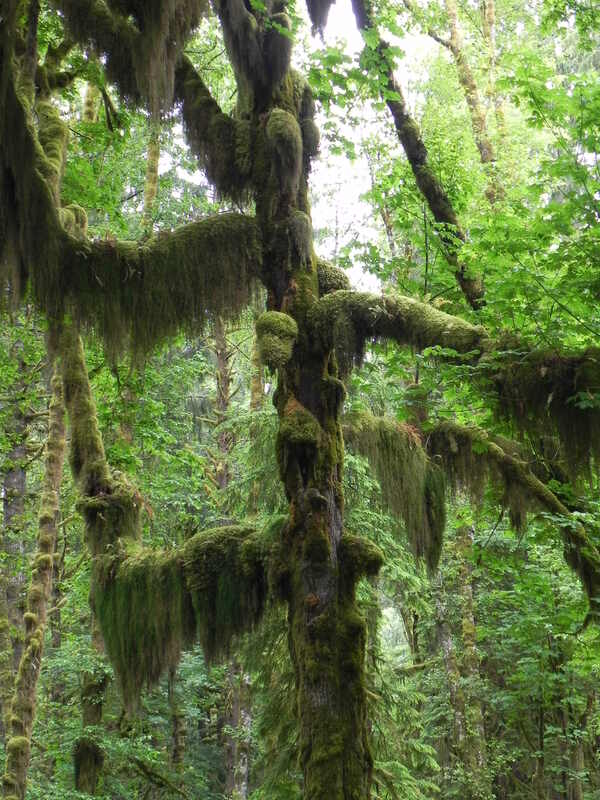 The Quinault Rain Forest is the wettest place in the lower 48; the Hoh River Valley, for instance, can receive up to 170 inches of rain annually. Had we only realized just how wet it normally was, we’d have taken more advantage of our first day. Instead, Connie and Lucy found a nearby laundry and washed/dried our clothes. We’ve discovered that when you’re traveling light, you need to wash clothes every week. Ken Burns, in his riveting National Park series revealed just how close a call this park had. During the last 48 hours of his presidency, Teddy Roosevelt used the Antiquities Act to set aside 615,000 acres as Mount Olympus National Monument. Unfortunately, President Woodrow Wilson crumbled to pressure from logging interests and cut it in half. At stake was the largest specimens of Douglas fir, red cedar, Sitka spruce, and western hemlock in the world. Ten different times attempts were made to protect the area—each time, timber interests won out. Upon the counsel of Harold Ickes, FDR, in 1937, went out to Washington to study the situation for himself. But timber interests did their best to hide what was happening from him—but fortunately he got wise in time. 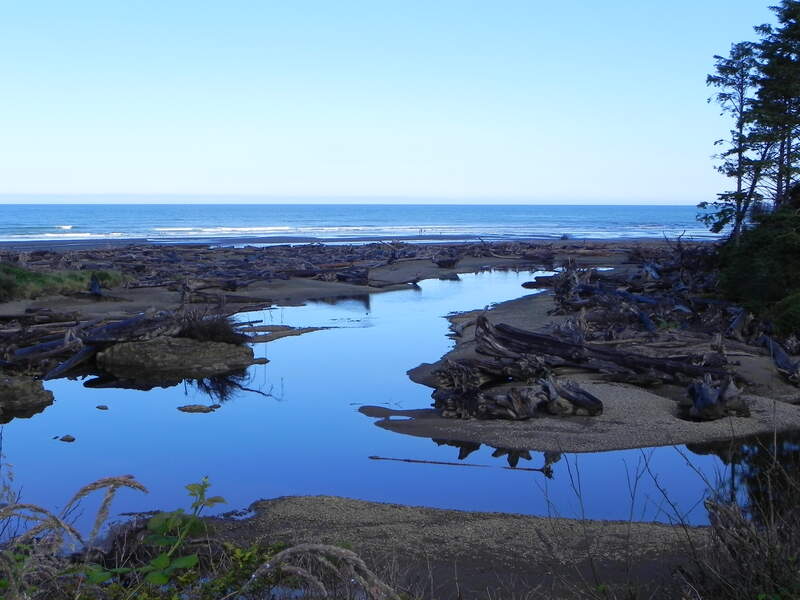 Just as loggers were approaching the last virgin stand of rain forest, on June 29, 1939, Roosevelt signed the bill that created Olympic National Park. (Duncan and Burns, 298). We had no idea when we began this national parks trip that it would prove to be such a journey of discoveries. One of which had to do with an architect we’d never heard of before: Robert Reamer. His biographer, Ruth Quinn, titled her splendid book on his life and works Weaver of Dreams, for that’s what he was. And we have been privileged to stay in three of his great lodges on this trip: Lake Quinault, Old Faithful, and Lake Yellowstone Hotel. 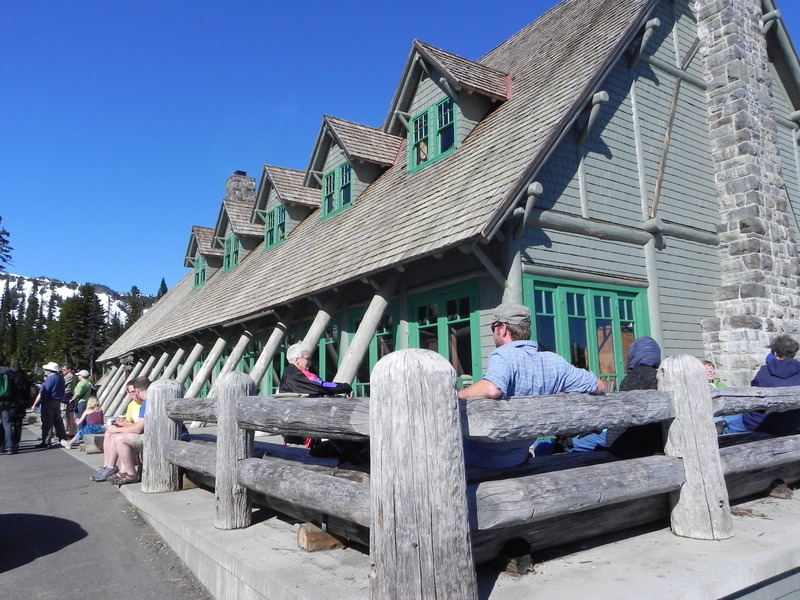 On August 28, 1924, the previous Quinault Lake Hotel burned to the ground; since a new one was needed right away, Robert Weaver was chosen to design it. Being that they needed to reopen the new hotel right away, on June 9, 1926, a crew of 35 – 40 men arrived at the site; 100,000 board feet of virgin timber was hauled in; and bonfires were lit at night so that the men could work around the clock. Incredibly, it had its grand opening on August 18. Each of Reamer’s creations has its own distinct style—he never went back or cloned. In this case, Frank and Estella McNeil desired a hotel that was elegant yet homey. Miraculously, that is exactly what Reamer gave them. A great central fireplace anchors the one and a half story 62-foot-long lobby, and that is flanked by two 56-foot wings. The style of the lodge has been variously described as rustic, Colonial, Northwest Georgian, and Norman. Also on the first floor are a 54 by 36 foot ballroom, dining room, sweet shop, kitchen, and pantry. President Franklin D. Roosevelt came here on his 1937 fact-finding tour, eating dinner here with his entourage on Oct. 1. The bay-window alcove where the President sat is still the most requested table in the house. That first afternoon, while the washing was being done, Bob and I walked down to see the world’s tallest Sitka spruce only a mile away from the lodge. We ate dinner at the Salmon Café. In the evening, we relaxed in that one-of-a-kind lobby. A father and son played chess with the lodge’s huge chess-pieces (each piece at least a foot high!). Over at the upright piano, a sing-along was taking place—one young man sang enthusiastically and loudly—off key. But no one seemed to mind. A fire was crackling in the great fireplace, and the lamplight cast a golden glow on everything. Next morning, we awoke to drizzling rain. I showered in an old-timey tub with claw feet. Went after coffee so I could resurrect Connie. The breakfast was delicious. Then since it was raining—there was a rain gauge on the lakeside wall, measured in feet, not inches. The gauge indicated 15 feet in their highest year, 180 inches!—we decided to take the rain forest tour. Mike Turner (the facilities manager), seeing we needed a fireplace-fix in the interim, graciously had big logs brought in, and soon few walking by could resist walking over to the fireplace to bask in its warmth. Our guide (Sandy) picked us up at 9:30. Sandy was one of those rare guides who are so passionate about what they do that they’re worth their weight in gold. It was the first time in our lives any of us had really experienced a rain forest first-hand. She led us on several misty walks into the ghostly old growth forest with moss and lichen bedecked trees, brooks, creeks, nursery-logs (when trees feed on fallen members), wildlife, etc. A winter wren sang to us. Sandy told us about the terrific 2007 storm with 90 – 130 mph winds, torrential rain, wholesale slaughter of trees—electricity was out in the region for two weeks. Then, a natural story-teller, she told us the fascinating story of the epic Press Expedition into the heart of the Olympics in 1888-9. An amazing story of endurance and near starvation. Later, Bob and I took another short hike into another section of the rain forest. We spoke to three young women who’d volunteered to help build or repair forest trails for the Washington equivalent of FDR’s CCC. 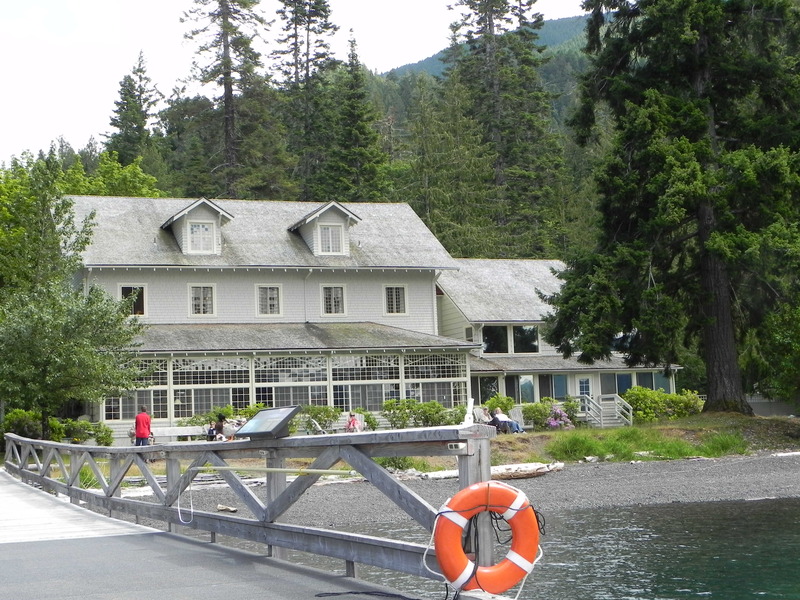 Our next stop is Crescent Lake Lodge in Olympic National Park. Barnes, Christine, Great National Park Lodges 2 (Portland, OR; Graphic Arts Books, 2008). Duncan, Dayton and Ken Burns, The National parks: America’s Best Idea (New York: Alfred A. Knopf, Random House, 2002). The Most Scenic Drive in America (Pleasantville, New York: Reader’s Digest Association, Inc., 2009). Oregon and Washington Tour Book (Heathrow, Florida, American Automobile Association, 2010). Quinn, Ruth, Weaver of Dreams (Gardiner, MT: Leslie and Ruth Quinn, Publishers, 2004). Scott, David L. and Kay W., The Complete Guide to the National Park Lodges (Guilford, CT: Globe Pequot Press, 1998, 2009). A beautiful morning in Stehekin! But rare is the journey where everything goes right. In our case: somehow, somewhere, Bob had lost his driver’s license! No small problem when you’re switching drivers every day. With only one phone on the “island,” It was difficult for Bob to set in motion a process whereby he could secure a substitute license on short notice. Our breakfast over, we checked out and reveled in our last couple of hours before returning to civilization. But all too soon the blast of the fast boat’s horn told us it was time to go. At 28 mph, we were able to make it back to Chelan in only two and a half hours. No driver’s license in Chelan—more phone calls. Then it was back on hwy 97 through the Wenatchee Valley, the “Apple Capital of the World.” When hwy 97 turned south we joined hwy 2 on the Southern Cascade Loop. Leavenworth—an unlikely success story of an old logging town that was given up for dead. A group of residents banded together and searched for ways to end their thirty-year recession. Someone came up with a break-through solution: since they were perfectly positioned near the confluence of two great national forests, the Wenatchee and Snoqualmie, encircled with snow-capped peaks, and blessed by a white water river, why not go Bavarian Alps? Why not indeed? What did they have to lose? By the early 1960s, the plan was put in motion: they reinvented themselves as a Bavarian alpine village. It paid off: Today, 1,200,000 visitors a year help fill the little town’s coffers, with nonstop festivities. This year alone, they put on the Leavenworth Choral Festival (April 10), Ale Fest (April 17), Maifest (May 7-9), Spring Bird Fest (May 13-16), Bavarian Bike and Brews Festival (June 5), Wine Walk (June 5), International Accordian Festival (June 17-20), Kinderfest (July 4), International Dance Festival (June 26-27), Wine Tasting Festival (Aug. 21), Quilts in the Village (Sept. 8 – 12), Salmon Festival (Sept. 18-19), Washington State Autumn Leaf Festival (Sept. 24 – 26), Oktoberfest (Oct. 1-2, 8-9, 15-16), Christkindlemarket (Nov. 26-28), Christmas Lighting Festival (Dec. 3-5, 10-12, 17-19), and Icefest Jan 15-16, 2011). It wasn’t easy, but we somehow managed to reach Leavenworth between festivals. 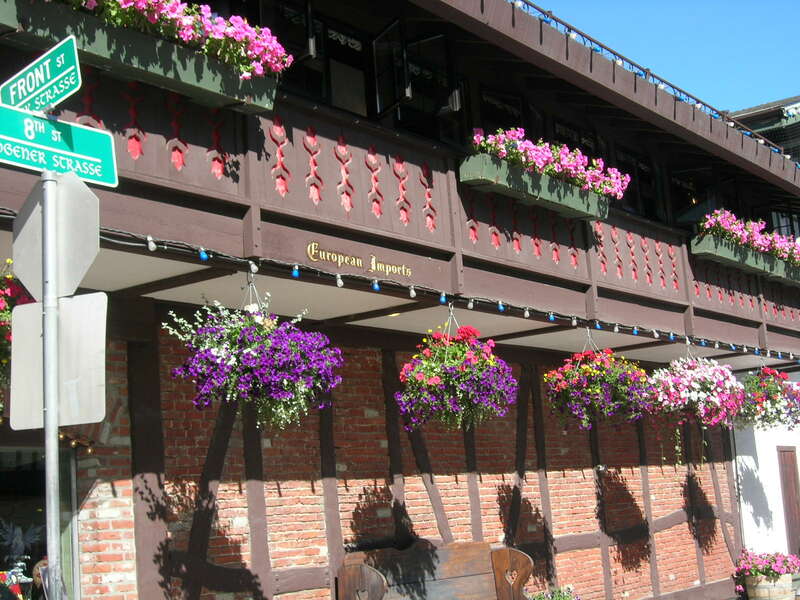 Our nephew Byron Palmer’s second suggested place to stop in Washington was Leavenworth’s Enzian Inn (he and his family always stay there when in the area). Thus it was that with all the other Bavarian motels to choose from, we checked in at the Enzian Inn. One of the reasons we so enjoy staying in national park lodges is that each is unique, a quality in all-too-short supply in today’s cookie cutter lodging age. Rarely do we find anything “different” about a chain hotel or motel. But Bob and Rob Johnson shared a dream: that they could more than compete in a chain-motel age. Together they created an inn that is not only Leavenworth’s largest, it is also the product of craftsmanship and talent in wood. It is a thing of beauty. You notice it immediately when you enter the beautiful foyer and look up at the second story mezzanine—just as is true with Paradise Inn’s. Everywhere, upstairs and downstairs, there are lounge chairs, sofas, and couches for guests who wish to chat with each other, relax, read by the great fireplace on the first floor, or play board games (there’s a wall of them to choose from—also puzzles—on the second floor mezzanine). Also an outside deck overlooking the picturesque little town. After walking through the town, eating at an Italian restaurant (not everything’s Bavarian! ), and pigging out on ice cream, we returned to the Enzian where we again played Phase Ten—Bob had the nerve to beat us. While we were playing, people gathered around the beautiful old Charles M. Stieff grand piano downstairs. Soon the evening’s performance began: not classical but music generations of Americans have loved. Applause (from both floors) followed each number. The pianist played for a full hour and a half. Every night of the year such an evening concert for the guests takes place here. The guest rooms were just as lovely as the inn. Next morning, we went up to a ballroom-sized fourth-floor vista room, where a veritable feast awaited us–all complimentary. Hot omelets and scrambled eggs made to order, hot cereal, breads, muffins, juices, fruit, bagels, coffee, tea, pastries of every possible kind—oh, the list could go on and on. In a word, it was overwhelming—all served by waitresses in Bavarian dresses. 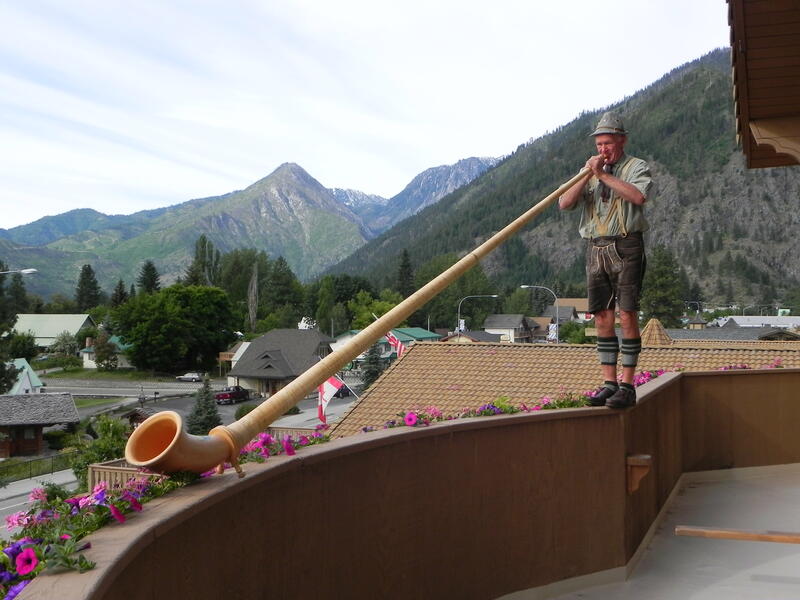 About half-way through, Bob Johnson came in, wearing his lederhosen and cap, lugging his great Alpenhorn, mounted the outside balcony rail, and then we heard it—the whole town heard it—straight out of the Alps. Every day, either the father or the son plays the Alpenhorn twice during the breakfast hour. I am including this segment in our lodge series because here is living proof that not all great lodges are found in parks. That here in a small Washingtown town that has reinvented itself, a father and son decided that rather than just build another cookie cutter motel, they’d build something out of the golden age of hotels, with old-timey space to relax in, in their equivalent of a great hall, a mezzanine to tie the two floors together, a fireplace to dream by, live piano music each evening, a breakfast you’d pay $50 for anywhere else, then the Alpenhorn music thrown in for good measure—all for the same price everyone else in town charges. It boggles my mind! But it works: The inn was full. AAA Oregon and Washington Tour Book (Heatherow, Florida, 2010). “History of Leavenworth, Washington (a hand-out). “The Alpenhorn at the Enzian,” (a hand-out). The Most Scenic Drives in America, (Pleasantville, New York: Te Reader’s Digest Association, Inc., 1997). “Sonnenschein auf Leavenworth,” (Leavenworth, WA: NCW Media, Inc., 2010). 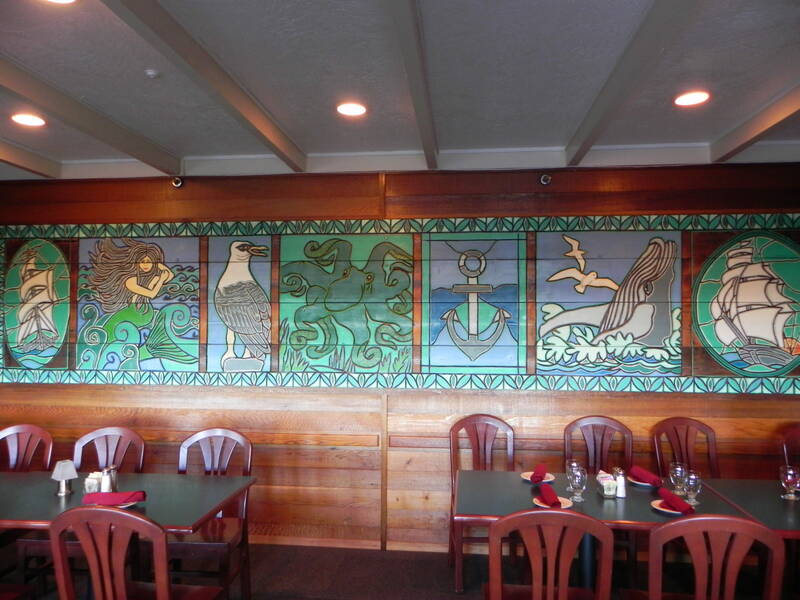 We were in no hurry to leave Paradise Inn dining hall. Indeed, we wished we could stay there another day, but since the hotel was all booked up and our other reservations had been made long before, Lucy and Connie settled into their nests in the back seat; in the front, we changed drivers, and drove down the mountain. Just before we arrived at the Stevens Canyon Entrance, we passed through the Grove of the Patriarchs. Another “blessing for another time” was to return here and revel in those thousand-year-old Douglas firs and western red cedars. Passing through the rugged Tatoosh Wilderness on hwy 12, we continued on to one of the nation’s best known fruit-growing regions, the Yakima Valley; from here we took hwy 97 north, arriving at Lake Chelan in mid-afternoon. Here we checked in at the Lakeside Best Western, beautifully landscaped with flower-beds, shrubbery and trees. Here and there in life, if we’re both adventurous and lucky, we stumble on certain places that are magical. When we’d told our nephew, Byron Palmer (who works for Alaska Airlines) that we planned to explore Washington state, he categorized Lake Chelan and Stehekin as “must-sees.” But even though we found the south end of the lake to be attractive, nothing prepared us for the northern terminus 51 miles away. Next morning early, we boarded Lady of the Lake II for what turned out to be a journey into a time warp. As the boat moved north, the genial captain pointed out places of interest—the verdant orchards and vineyards gave the lake a Mediterranean look. We learned that fjord-like Lake Chelan is the third deepest lake in the United States, its 1,486-foot depth exceeded only by Crater Lake’s 1,932 and Lake Tahoe’s 1,645. We were surprised to discover that Chelan is considered to be the deepest gorge in North America: the Grand Canyon of the Colorado is a mile deep, Kings Canyon is 7,800 feet deep, Hells Canyon is 8,200 feet deep, and Lake Chelan’s gorge (given that it plunges down to 386 feet below sea level) is 8,631 feet deep. Indeed, so deep is the lake that we were told it takes the water flowing in to the northern part of the lake from Stehekin River ten years to reach the south end 51 miles away. Needless to say, its greens and blues, being glacier-fed, are a feast for the eyes. Roads reach only the midway point of our four-hour boat trip. Soon cell phones ceased to function, no power lines or telephone lines exist, and human habitations are mighty few. We did see one bear off to our right. The Lady made several stops to let people off or pick them up at wilderness jumping-off points. Other than the boat’s twin turbines, we heard nothing else. Looming high above us were the snowcapped mountains of the North Cascades National Park, reminding us no little of the Alps. Finally, we docked at a little hamlet of about 85 full-time residents few Americans have ever heard of—Stehekin. The only way one can get here is by boat, float plane, or trail. All motor vehicles used here are brought in or taken out once a month by barge. We disembarked and registered at Stehekin Landing Resort, all wooden buildings of recent vintage (1983 and later). We stayed in two of their lakeside cabins—the front-deck view was to die for. 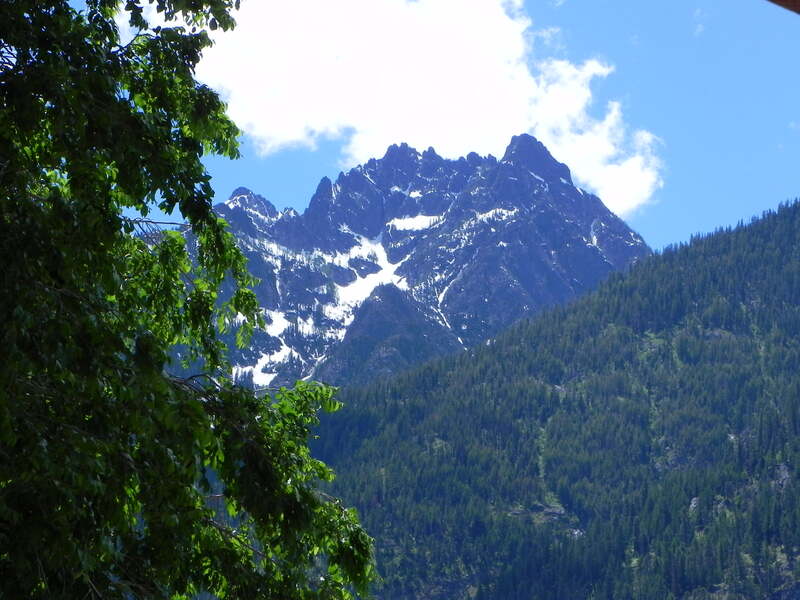 In 1814, Alexander Ross of the Northwest Fur Company became one of the first white men to explore the Stehekin Valley. But it was not until the first steamboat (built on the lake in 1889) that settlers and homesteaders moved in. Without electricity or roads from the outside world, lifestyles were little different from frontier life: water was carried from the river, wood was used for both cooking and heating, kerosene lamps were used at night. Not until 1963 did Chelan County PUD put in a small hydroelectric plant so folks could have electricity. When the North Cascades National Park was established in 1968, the southern part of Lake Chelan was excluded. 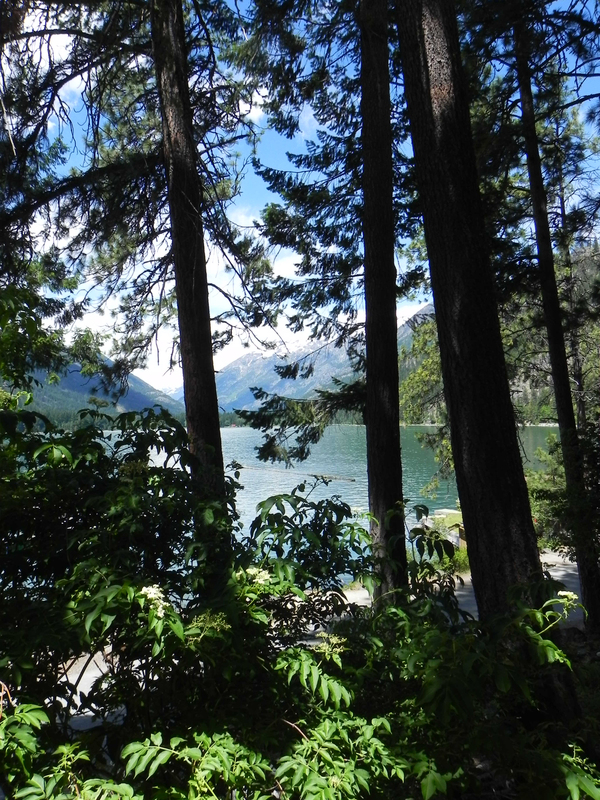 A park headquarters was established in Stehekin. Part of the legislation mandated that a road would never be built into Stehekin. Since that time, preserving the Stehekin way of life and cultural history has become a mutual effort between the community and the park service. Stehekin really comes to life in the summers, and the population swells in order to accommodate people like us. Young people especially revel in coming here where there is no TV and only one satellite telephone—it is such a different world from anything they’ve ever known before. 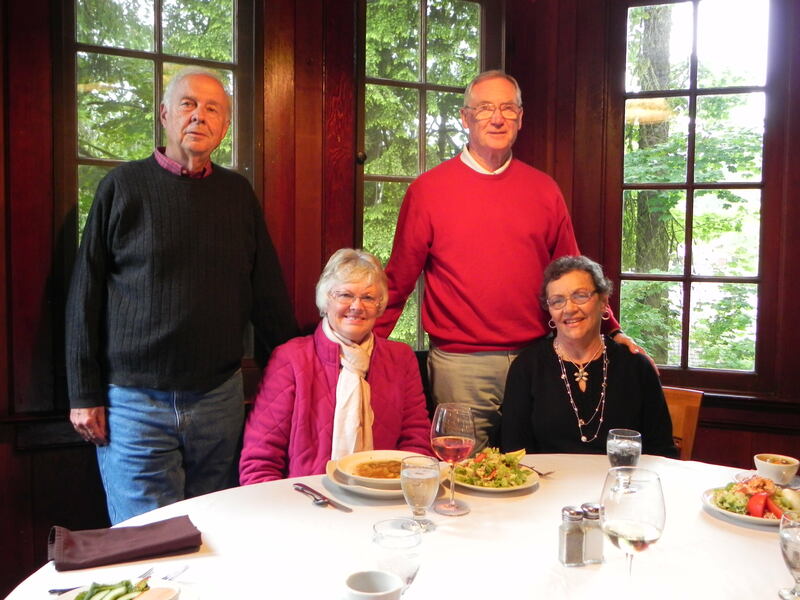 We found them a joy to talk to as they served us in the rustic dining room. In mid afternoon a driver was rounded up to shuttle us up to Rainbow Falls. We were totally unprepared for it, for it was something on the scale of waterfalls in Yosemite. 321 feet high, you can hear its thunder before you ever see it—yet, unbelievably, it appears to be virtually unknown. We have nothing that can compare to it in the Colorado Rockies. It wasn’t just its height that impressed us, though it did—it was the sheer volume of water coming over the falls. As we walked part way back, we saw few motor vehicles but quite a few people on bicycles. We stopped to inspect the old log-cabin schoolhouse so reminiscent of those of a century or two ago. We moved on, following signs to “The Bakery.” First town I’ve ever been in where a bakery was the destination so many people considered central to their lives. We stopped there. Back at the landing, it gradually came home to us that when the year-round towns-people spoke of Stehekin as “the island,” it really made sense, for they are cut off from the rest of the world—one of the very few hamlets in the lower 48 where this is so. In the winter, when boats (and the mail and supplies they bring) reach here only three times a week, Stehekin settles down to an even quieter life. Since there may be five or six feet of snow on the ground, with Chelan 51 miles away having none, it’s not too surprising to hear—as I did!—that the north end of the lake was 600 feet higher than the south. Go figure! We found the park headquarters to be a magnet; Connie rushed over there (about 500 feet) to get her park passport stamped first thing. In the evening, I attended a lecture there. In talking to locals, I discovered that a number really sacrifice in order to live here (one dentist works all week in Ellensburg, returning home by boat for weekends). Children are either home schooled or attend the “newer” schoolhouse (if the snow’s not too deep). The postmistress is a retiree who came here in order to experience life again, to be needed. She and her husband love it on the “Island.” When she takes mail to the boat, she locks the door “because of federal regulations—but I really don’t need to here,” she told me. During the night, the wind came up. Its sound in the evergreens was wonderful. With no other sound, and the lights off around us, it really seemed like another world. Next week it’s on to Enzian Inn and Leavenworth. Barnhart, Mike and Nancy, Stehekin: A Mountain Community (Stehekin, WA: Bridge Creek Publishing, 2003). Barnhart, Mike and Nancy, Lake Chelan and the North Cascades (Stehekin, WA: Bridge Creek Publishing, 2000). The Lady of the Lake (Stehekin, WA: Ladyofthelake.com, 2010). Lake Chelan (Chelan, WA: Lake Chelan Chamber of Commerce, 2010). Lake Chelan, Washington (Chelan, WA: Lake Chelan Chamber of Commerce, 2010). North Cascades National Park (Las Vegas: K.C. Publications, 2008). Hackenmiller, Tom, Ladies of the Lake (Wenatchee, WA: Point Publishing, 1998). The Stehekin Guidebook (Stehekin, WA: Stehekin Heritage, 2010). There were swarms of skiers getting ready to hit the slopes, to greet us as we walked down the steps of Timberline Lodge—one girl crying because her boots were too tight. The view was so breathtaking we had to just stare, downloading it to our memory disks. Then it was down the mountain. At Sandy, we stopped for breakfast at the Tollgate Inn Restaurant, well known for its old-timey appearance, great breakfasts, and (in its bakery), the best pecan sticky buns any of us could ever remember eating. Connie almost cried when she gobbled up the last bite. Then we moved on through the town of Boring. I’d waited all my life to tell the story (affirmed to be true) of a certain Pastor Dull of a Boring church—how they’d finally had to move him. Then it was back on boring (pardon the pun) I-5 again. Once past the bridge over the great Columbia River, we were in Washington at last. None of us were very familiar with the state; in fact, that had been another reason for making the trip: Washington is so far north (like Maine in that respect) that you have to make a special effort to get there. We could hardly wait to explore it more fully. Finally, we escaped I-5 and turned east on Hwy 12; turning north on hwy 7, and east again on hwy 706. We stopped at the pioneer village of Longmire, famously homesteaded by James Longmire in 1887-8. Longmire was one of the first to bring tourists up to Paradise Valley. When his daughter-in-law first saw its king’s ransom worth of wildflowers (due to the 250 feet of rich volcanic soil), she exclaimed, “This must be what Paradise is like!” It has been called “Paradise Valley” ever since. John Muir later declared it to be “the most extravagantly beautiful of all the alpine gardens I ever beheld.” It was also one of the favorite spots on earth for Stephen Tyng Mather, founding father of our national parks. Mather first climbed Mt. Rainier in 1905; he returned in 1915 to oversee the first road into Paradise Valley (Duncan and Burns, 240). Ernest, the protagonist in Hawthorne’s “The Great Stone Face,” lived so long in the shadow of that great rock outcropping that his own face came to mirror it. Just so, Washington’s highest mountain (14,441 feet); so vast that it makes its own weather, is so dominating that its image is indelibly etched into the subconsciousness of all those who live within sight of its great white mass shouldering its way into Washington’s sky, reminiscent of Mount Shasta’s dominance of northern California. The sixth recorded person to climb it was John Muir (in 1888). As Muir viewed the wholesale annihilation of Washington’s old growth forests by the voracious logging barons, he felt the Glory of the Northwest was certain to be ravaged as well. He marshaled the forces of the newly formed Sierra Club, the National Geographic Society, and Northern Pacific Railroad tycoon Louis Hill. 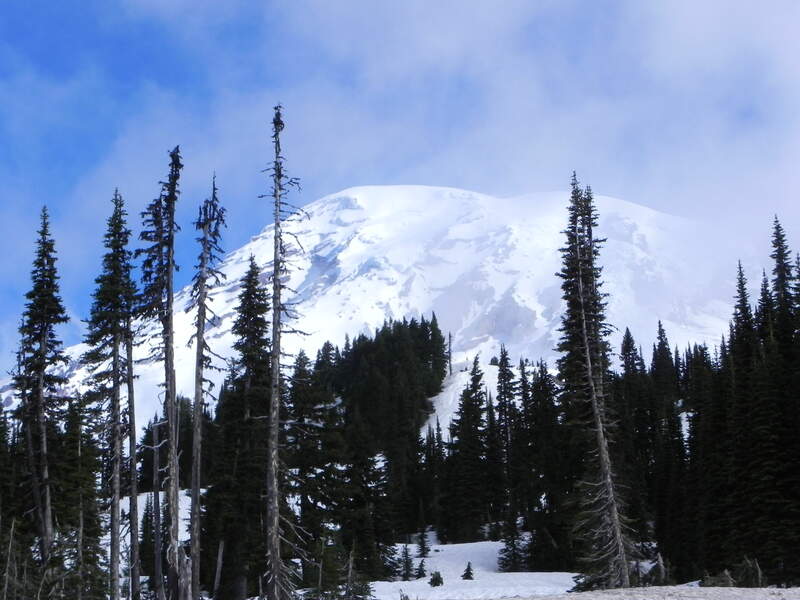 It paid off: in 1893, President Benjamin Harrison made the mountain the centerpiece of the newly created Mount Rainier Forest Reserve; in 1897, Congress expanded it into the Mount Rainier Forest Reserve; in 1899, with President William McKinley’s backing, it became our fifth national park. But Mather wanted a hotel in Paradise Valley worthy of its mountain. In 1916’s short summer season, that long-desired hotel was rushed into being. Great Alaska cedar logs were hauled in from an 1885 burn-site. The exterior was shingled with cedar. Two massive stone fireplaces anchor the 50 X 112 foot two-and-a-half-story great hall; later, a wrap-around second-story mezzanine would be added for structural support. The 51 X 105 foot one-and-a-half-story dining hall is almost as grand as the great hall. A fifty-foot stone fireplace fills its north wall. The most enduring furniture was crafted by German-born Hans Fraenke, a local contractor; every year for seven years, found him the first to arrive in the spring and the last to leave in the fall. 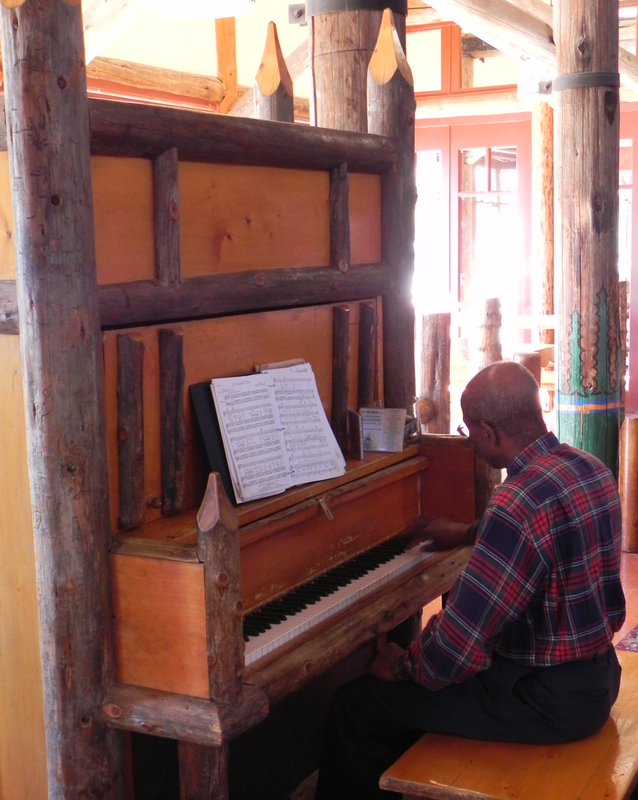 He hand-crafted (with an adze) the furniture to last—and it has: such things as a 1,500 pound table made of Alaska cedar, two larger than life throne chairs, a fourteen-foot-high grandfather clock, a mailbox made out of a large stump, and perhaps the piece de résistance, a standard piano transformed into an impressive work of art. Architect Laurian Huffman submits that it is this combination of soaring roof line and oversized furniture that makes you feel like one of the Seven Dwarfs entering Fantasyland because you become so small in relation to them. (Barnes, 56). Barnes notes that, “Over the years, alterations and decorative painting have changed some of the details of the great hall, but it retains the grandeur of its early days. Light streams in from the dormer windows high above the mezzanine, highlighting the repetitive structural framework with posts, beams and trusses that mark the architectural structure of the great hall. Iron rings grip the cedar poles, added to reinforce the splitting timbers, and a system of cables and metal bracing helps support the building against the onslaught of heavy snow. During the 1920s, additional cedar beams were added to create a permanent brace against the snow. The snow! It is one of the snowiest spots on earth: 640 inches the average (sometimes, up to 900 inches!). It has been a constant war every year with Mother Nature to save the lodge from crushing levels of the white stuff. Not coincidentally, units of the 10th Mountain Division in World War II were taught here how to survive winter combat. A million people find their way into this valley every summer; many of them were in the parking lot; fortunately, we had lodge reservations, otherwise we would have had a tough time finding a parking space. Even though it was almost July, the snow was so deep it was impossible to explore those famed fields of wild flowers still imprisoned in their seeds. Many visitors sat on the outside deck, drinking in Mount Rainier to the north and the also snowcapped jagged Tatoosh Range to the south. Inside, we entered an island in time. Around us on chairs and couches were people from all over the world. Just across from us was an intergenerational family I shamelessly watched: three adorable little girls who clearly had their doting grandfather totally under their little thumbs; their lovely young mother lovingly running fingers through her husband’s hair—a seraphic look of utter bliss on his face; the grandmother alternating between reading, looking fondly at her granddaughters, and staring at the crackling fire in the great stone fireplace on that end of the great hall. Other tableaus could be found everywhere in the long room. A pianist plunked away on the monster piano—almost always someone was either taking his picture or speaking to him—he played for hours (songs old and new), applause and baksheesh keeping him rooted to his chair. Quite simply, it was America as it used to be. Later, in the dining room, we lucked out with a window table and stared up at the mountain. Each waiter sported a badge identifying her/him by state or country of origin. Later on, I’ll dedicate an entire blog to them—how they are rising above the recession to see and experience the world. Dinner took a long time for no one—anywhere—was in a hurry to leave that enchanted room. Afterwards we listened to a ranger speaking about wildlife in the park, we ascended the stairs, found a table, played a game, and devoured the huckleberry pie and ice cream a dimple-cheeked beauty from Eastern Europe brought to us—she got plenty of exercise serving all of us on the four sides of the long mezzanine. The icing on the cake was a serendipity. Hearing there would be a total eclipse of the moon that night, I took a long walk. On the way back, perhaps the brightest golden moon I’ve ever seen gradually rose above the eastern hills—its radiance was almost unearthly! Photographers were already bringing out their cameras to set up for the 2 a.m. eclipse. I cravenly opted to return to the lodge and sleep instead. Barnes, Christine, Great Lodges of the National Park I (Bend, Oregon: W. W. West, Inc., 2002). [Her entry for Paradise Inn is a must-read]. Duncan, Dayton and Ken Burns, The National Parks: America’s Best Idea (New York: Alfred A. Knopf/Random House, 2009. [There is much about Mt. Rainier in the book]. “Mount Rainier,” National Park Service brochure. Scott, Dand L. and Kay W., The Complete Guide to the National Park Lodges (Guilford, CT: Globe Pequot Press, 1998, 2009). “The Tahoma News,” May-June 2010. National Park Service handout. White, Mel, Complete National Parks of the United States (Washington, D.C.: National Geographic Society, 2009). [Features a most informative section on Mt. Rainier]. 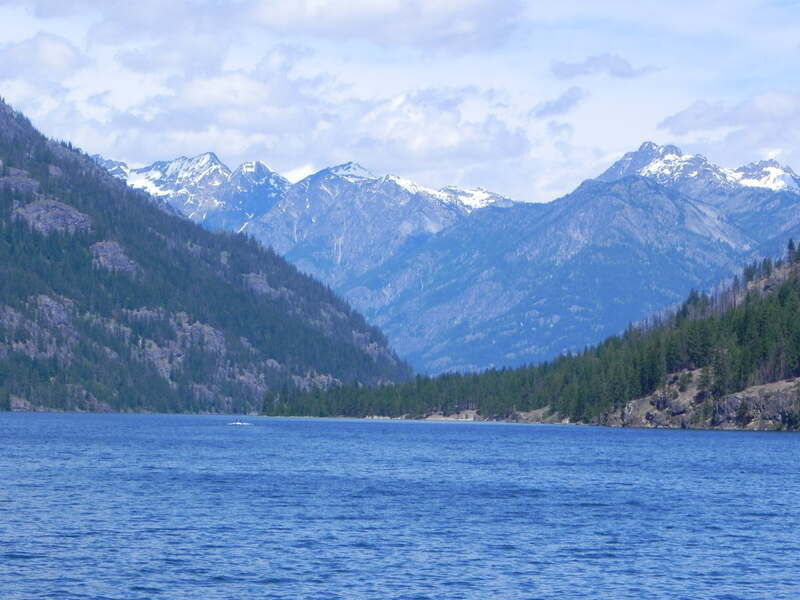 Next Wednesday, we move on to Stehekin and Lake Chelan.